Hello-hello… here we are again, smack dab in the middle of another political convention. 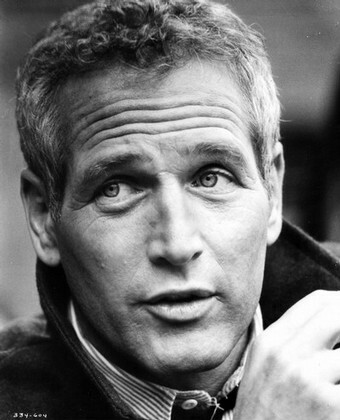 For one more night TP and The Princess Consort will find themselves tuned to CSPAN to follow the goings-on in St. Paul, turning to the network started by Brian Lamb, if and when we can no longer cope with the network and cable commentary. Has anyone else watched the ongoing spats and on-air fights between Keith Olbermann (below with flag) and Chris Matthews and occasionally Joe Scarborough on MSNBC? Here’s one description of such an incident via the Los Angeles Times of just one nasty encounter. This conjures images of Sister Mary Hand Grenade hovering at the front of the room in front of the black board with the ruler in her hand. If we could all play nice in the sandbox TP would find it all so much more watchable. BTW, in case you didn’t know, Mr. Olbermann is quite the original preppy, growing up in Westchester, attending Hackley and Cornell. Above, MSNBC’s Joe Scarborough on the air during the Democratic Convention in Denver last week. Below, a quick glance at a meeting Wednesday afternoon of vice-presidential candidate Sarah Palin, First Lady Laura Bush and possible First Lady Cindy McCain. 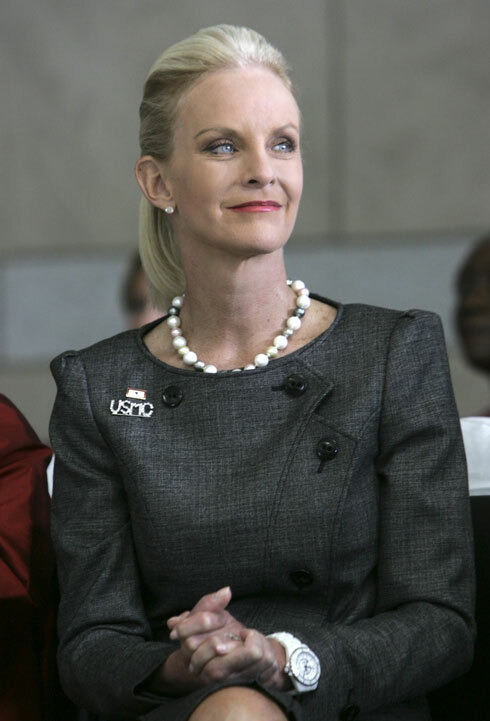 TP has been fielding questions about Cindy McCain’s style, her favorite designers, etc., and frankly, we feel quite inadequate to the task. We can provide some background information and photographs to help illuminate the topic, but really, there are many sources vastly superior to our little blog. 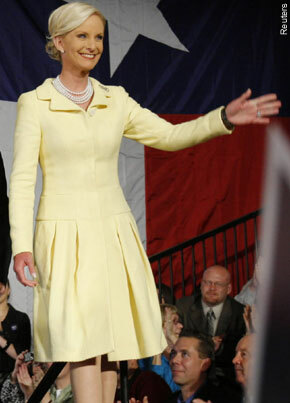 We commence our feeble attempts by showing both Laura Bush and Cindy McCain in designs by Oscar de la Renta as they approach the dais for their opening remarks at the Republican Convention. 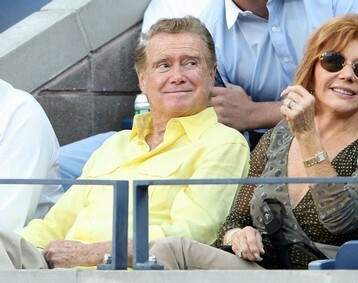 Ms. Bush is said to have been in heels by Stuart Weitzman, her only accessory a pair of pearl stud earrings. Tonight, a lush turquoise suit, with a double-breasted jacket reminiscent of some of the 40’s swing tops. Also this evening, Alaska Governor & vice=presidential candidate Sarah Palin in a dark grey suit, being greeted by Henry Kissinger. 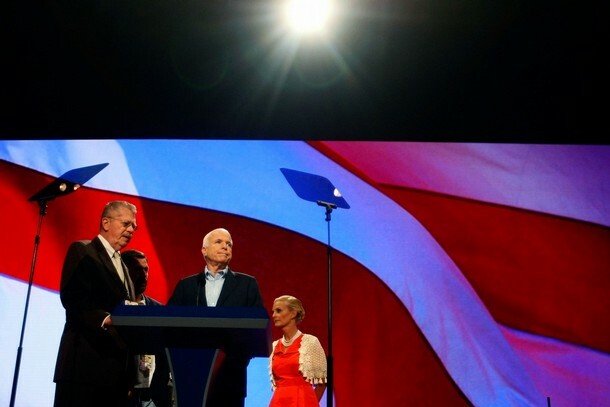 Below we see Ms. McCain at the convention in a deep coral-colored suit that appears to be a raw silk or silk shantung, and on the right, another dress, in this case a more pastel tone. In almost every instance one can note the two pins worn by Ms. McCain on a daily basis; they spell the words “NAVY” and “USMC”. 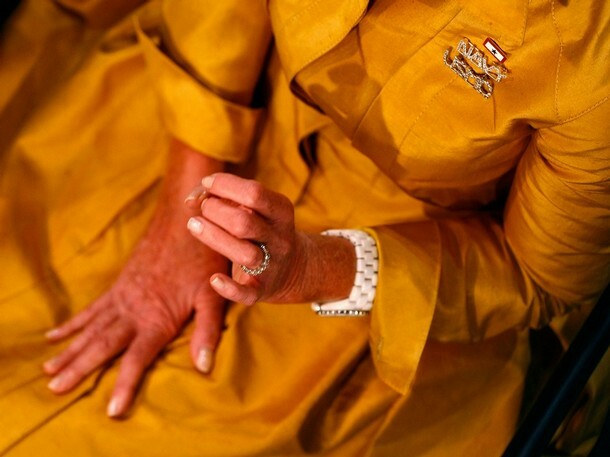 Below, the white Chanel J-12 wristwatch frequently seen on Ms. McCain’s wrist is visible. It is such an important part of the Chanel brand, the company has a special microsite for the watch. 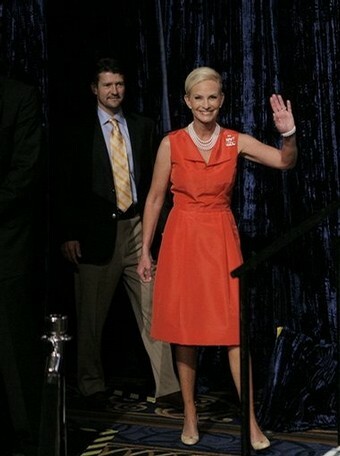 Below left an undated photo, and on the right a shot of Ms. McCain and Todd Palin, as they enter the “One Heart, One World” luncheon today, an event honoring Ms. McCain’s humanitarian work. Above on the right one can also see the constantly-in-use bone or taupe pumps worn by Cindy McCain throughout the campaign. 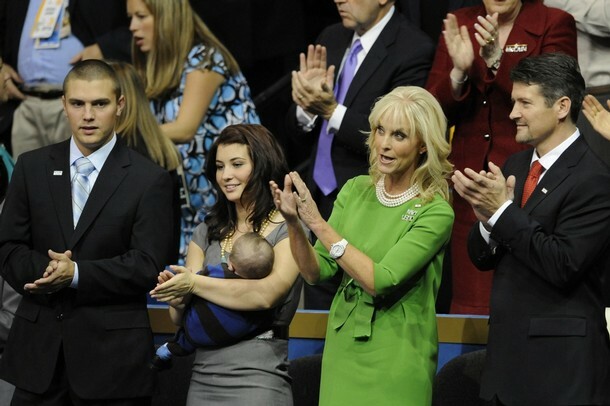 Below we see the vivid blue dress worn on the day Sarah Palin was announced as the vice-presidential choice by Senator McCain. 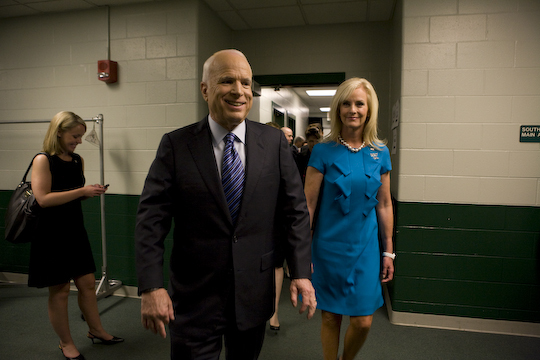 Ms. McCain is also known to be a fan of Carolina Herrera and Michael Kors. As evidenced in the photos, Ms. McCain favors bright colors and frequently wears suits as opposed to dresses, although of late we are seeing more dresses; rarely is she seen in patterns, or florals. Below, seated with the family of vice-presidential candidate Sarah Palin. The four-strand pearl necklace worn all week is visible in many of the photos, including those below. The rich green dress featured Grecian style draping on the back, a style TP finds more appealing in evening gowns, and a self-tied bow at the front waistline. 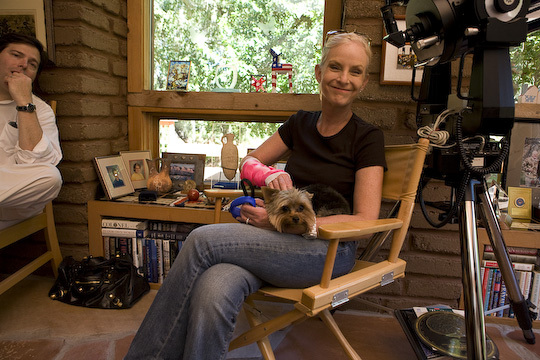 In more casual surroundings it is clear Ms. McCain is more than comfortable in a pair of jeans and a tee-shirt. While often seen with her hair up, sometimes in elaborate coiffed styles, Ms. McCain is often seen with it down, or loosely pulled back in a ponytail. Ms. McCain’s wardrobe must also suit her frequent overseas trips (often without her husband and also without media), for her volunteer work with Operation Smile and CARE. She also started the American Voluntary Medical Team, her own nonprofit humanitarian agency, which sent medical teams to disaster or war-torn areas around the world. Cropped sweaters, or shrugs are also favored by the always-on-the-go mother, wife, and philanthropist. The lower two photographs are from today’s walk-through for the presumptive candidate; the pink cast is for a wrist sprain. Of course, there is always the magazine cover shoot, requested by more publications than one knew existed. Here we see a People magazine cover shoot with both the McCains and the Palins. 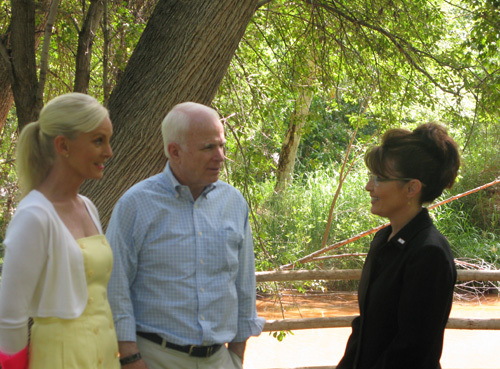 Most of these candid shots are from daughter Meghan McCain’s campaign blog. Here is the one TP absolutely adores, little Piper Palin with baby brother Trig. At some later point perhaps we can look more in-depth at more of the leading political candidates and/or spouses and their individual styles. Why the worry about the photos on the memory card? Because Kate Middleton is Prince William’s longtime girlfriend, and the photos were of the couple on their recent holiday on the Caribbean island of Mustique. The suspect was actually trapped with the assistance of The Daily Sun, when he tried to sell them the card with 40 photos of the two relaxing on vacation. His asking price? £50,000, or about $85,000. Tomorrow…? Well, we’ll just have to wait and see what trouble we can stir up.